This semi-documentary film (and Poland’s last Yiddish feature) features the comedy duo Szymon Dzigan and Israel Shumacher who had recently returned from the Soviet Union, and Jewish children who had survived the Holocaust. This film shows and explains different Jewish customs. Among the customs shown are children singing the Shem'a over a babies cradle. That is a common custom in Poland and Ukraine. Additionally, there is a wedding ceremony of Eastern European Jews. For string orchestra or string quartet. 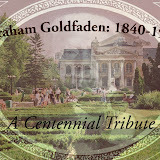 This entry is part of an online exhibit entitled: "Abraham Golfdaden: A Centennial Tribute," prepared by Eva Heinstein with help from the JMRC staff. To view the exhibit in its entirety click on the link above. 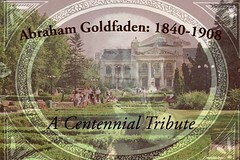 This entry is part of an online exhibit entitled: "Abraham Goldfaden: A Centennial Tribute," prepared by Eva Heinstein with help from the JMRC staff. To view the exhibit in its entirety click on the link above.